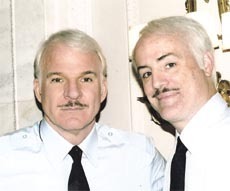 From the March issue: Viewers who tuned in to see actor/comedian Steve Martin being tackled by federal marshals on the NBC sitcom “30 Rock” this season actually saw Tim Gallin, a salesman at family construction firm John Gallin & Sons, dressed and wigged as Martin’s stunt double. There’s no question that times are slow in the real estate world, allowing some more time for hobbies and forcing others to take up a second career. For Gallin, who can also be seen doubling for Martin in the recently released film “Pink Panther 2,” the slowdown means more time for pratfalls. “You get some bumps and bruises, but I’ve been fortunate,” said the 52-year-old Gallin, whose most serious mishap in the stunt business has been a knee injury.